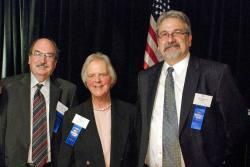 2009 Judicial Excellence Award Winners: James Hiatt, Doris Burd and Brian Bowen. The Honorable James H. Hiatt of the 8th Judicial District (Jackson and Larimer Counties) is the honoree in the District Court category. Following a career in Legal Aid offices in Oklahoma and Colorado, and private practice in Fort Collins, Judge Hiatt was appointed a district court magistrate in 1984 and to the district court bench in 1986. Having exhibited exemplary judicial and administrative skills, and having earned widespread respect for his knowledge and consistent judicial temperament, he was selected as the Chief Judge of the district in 2000. Judge Hiatt was described by one of his nominators as “among the most intelligent, thoughtful, respectful, kind, well-written, neutral and insightful judges whom I have been privileged to appear before in my 28 years of legal practice”. Another supporter indicated the Judge Hiatt is “well-prepared, fair, efficient and careful with the delicate balance between human beings and the complex rules under which we all must live.” A short nine months after his appointment as Chief Judge, he oversaw a seamless move into the new Larimer County Justice center facility. Thanks to his leadership, not a single day of judicial business was lost due to the move. This feat of “administrative prowess” earned the respect of the County Commissioners and would not have been possible without the consistent support of the entire judicial district. During his tenure, Judge Hiatt devoted significant energy into expanding efficiency standards and practices throughout the district which have resulted in dramatically improved timelines and the effective use of increasingly limited resources. Judge Hiatt has never shied away from difficult or high profile cases and the local and national publicity and partisan criticism that often accompanies them. Judge Hiatt has served on the Colorado Judicial Coordinating Council, Colorado Commission on Judicial Discipline, Statewide Methamphetamine Task Force, Caseflow Leadership Task Force, and the Governor’s Task Force on Children. He has acted as a mentor and educator for judicial colleagues. Judge Hiatt was recognized with the Judge Conrad L. Ball Award for significant improvement to the quality of just in Larimer County in 2009, as the Outstanding Judicial Officer by the Colorado Judicial Branch in 2003, as the Outstanding Jurist by the Larimer County Bar Association in 2002, and with the Liberty Bell Award for Outstanding Jurist by the Larimer County Bar Association in 1997. Judge Hiatt retired from the bench in July 2009. The Honorable Doris E. Burd of the Denver County Court is the 2009 honoree in the County Court category. Judge Burd’s legal history includes service with the Legal Aid Society, as the Clinical Education Supervisor at the University of Denver College of Law, and in private practice for nine years prior to her appointment to the Denver County Bench in 1989. In her nomination, Judge Burd was described as “a judge’s judge” for her commitment to judicial independence, devotion to ethical standards, legal knowledge, and service to her colleagues. Requiring a considerable time commitment and knowledge of the needs of the court, Judge Burd chairs the Denver County Court Resources Committee which is charged with determining the allocation of increasingly limited resources. In her most recent performance evaluation, Judge Burd was commended for her “exceptional judicial demeanor”. Judge Burd has also dedicated time to educate students about the legal system and role of the judiciary through her activities with mock trial programs and classroom visits. For a decade, she served on the Juvenile Justice and Delinquency Prevention Council – a statewide Council which promotes juvenile issues. In the broader community, Judge Burd served on the board of the Washington Park Community Center and has worked with Denver Digs Program of the Park People. Magistrate Brian N. Bowen of the 17th Judicial District (Adams County) is the 2009 honoree in the Magistrate Category. Following a career in private practice, as a municipal and special prosecutor, a municipal judge, and a small claims magistrate in Weld and Adams counties, Bowen was selected as a Magistrate in the 17th Judicial District in September 2003. Throughout the many glowing letters in support of his nomination was recognition of his extraordinary judicial demeanor, his commitment to providing all in his court the chance to speak and ask questions, and his willingness to volunteer in support of colleagues, staff and profession. Magistrate Bowen has a widely varied caseload, and in the words of his nominator “moves quickly and easily between case types, switching gears seamlessly” while still placing a focus on explaining all proceedings in simple and clear terms for participants – especially children and families. He currently serves on the Racial Overrepresentation Committee, Employee of the Quarter Committee, Access to Justice in Adams and Broomfield Counties, Adams County Youth Initiative, and co-chairs the Truancy Consortium. Magistrate Bowen has served in leadership positions with the Colorado Magistrates Association, the Colorado and Adams County Bar Associations, A.C.C.E.S.S. Housing, Inc, Commerce City Housing Corporation, LINK Juvenile Assessment Center, and the Adams County Youth Initiative. He serves as an educator with numerous programs including the Aims Community College Police Academy, Child Support Enforcement Conference, Association of Code Enforcement Office, and the Grandparent’s Raising Grandchildren Program. Magistrate Bowen was recognized as the Adams County Pro Bono Attorney of the Year in 1993, the Adams/ Broomfield CASA Program Judge of the Year in 2006, and was a finalist for the Colorado Judicial Department Judicial Officer of the Year in 2006. Magistrate Bowen has organized a benefit fundraiser for the family of a slain colleague, created a Relay-for-Life team, serves many leadership roles at his church, and volunteers with the local food bank.